Leo, a quiet, lonely eight year old boy, receives a letter telling him the day he will die. This is just the first of a series of messages warning him of a fatal ending. His parents start searching for answers, and finally face a terrible discovery. Is Leo himself the sender of the messages? Aarón decides to break up his ten-year relationship with Andrea. That night, he asks his friend David to go down to the American's shop to help him out with a delivery. There, behind the neon OPEN sign, David is shot. Tormented by guilt, Aarón searches for an explanation for the tragic way their fates have crossed. Both stories take place in Arenas de la Despernada, a suburb of Madrid proud of its lake, its private university and waterpark, where the greatest secret turns out not to be the dark silhouette which sometimes appears behind the curtains of the house at the end of the sandy path. 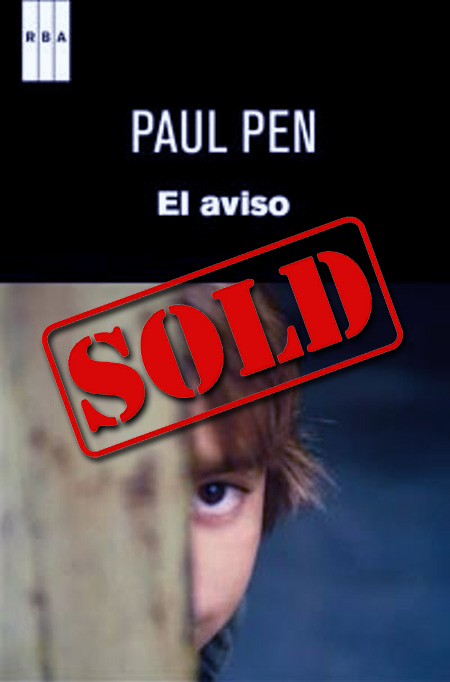 "Paul Pen's (The Warning) is a wonderful first novel. The inevitability of fate, bullying, a mother's ill-treatment of her son, a father's cowardice, the loneliness and fear of a child, guilt. These are the themes it deals with as a crime and horror novel. Written in two different times, with a double plot that slowly converges. (...) Pen doses the tension well and convinces the reader that fate is something you can't escape from." Rosa Mora, Babelia. EL PAÍS.